What is it about redwoods? Walking through a new forest of redwoods always gets me thinking about the old ones. If a Hollywood Indian chief were handy, he’d probably tell me it’s the spirit of their ancestors tweaking my conscience. We call the remaining ones old-growth redwoods. Hundreds of feet tall, saplings when the Romans ruled Europe. Our ancestors cut down almost every example that was ever alive in the past 200 years; some folks are offended by resistance to cutting down the rest. Yesterday I pictured the hills of Phleger Estate full of big, fat, ancient trees, so few of which survive outside the bounds of Big Basin Redwoods State Park. Had to imagine it, because I sure couldn’t see any. Think about that next time you’re walking through a “second growth” redwood forest. That is, think of it gone. 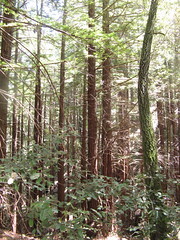 We have spectacular parks and trails in the lands where the redwoods have regenerated. In our lifetimes these these trees have essentially always been here. But between 1850 and the aftermath of the San Francisco earthquake of 1906, these hills we prize were logged almost to the last tree. The only ones left standing were in extremely remote locales like Big Basin, kept alive mainly because they were too far from the nearest roads to be profitably cut down. It’s depressing to think of all the trees they killed to turn a buck, but it’s hopeful to think about people’s attitudes changing. These days it’s far more fashionable to save a forest than cut it down (at least in the United States, where we export our environmental degradation to less prosperous climes). Or something. Whatever it is, I get it in the redwoods in ways that never seem to happen anywhere else. In the Santa Cruz mountains you see a lot of “fairy rings” around old dead stumps. That’s a ring of small root or bud sprouts which have grown up at the same time after the death of the larger tree, and have now grown into tall trees in a ring. It’s depressing to think of the old growth tree that perished at the hands of human ignorance, but it’s also encouraging and inspiring to think about how resilient the redwoods are. There was absolutely no help that they got to regenerate. None! Sequoias can regenerate in 3 ways. They have cones, but they can also regenerate by buds in the base of the tree, and in the Burl. They can also generate sprouts directly from the roots. You can see evidence of these spurious sprouts every year. When you discover the facts about the sequoias they are fascinating. Oh yeah, one more thing. According to my wife, who is really into Indian artifacts and lots of spiritual things, plants do respond to input like sounds, touch, and for lack of a better term, “spirit” or consciousness. So don’t underestimate legends. Trees can be your friends. Yep, the climax redwood forest is a special kind of humbling place and that is for sure. Did you know that a lot of the redwood timber that was cut here back in the days of the horse/mule/ox teams and steam donkeys was used for fuel? Drying hops, heating buildings, firing boilers (as well as becoming lumber and split fencing and shakes) became the fate of many of the ancient ones. Beer and fence posts. Fantabulous. Many years ago I worked for the folks who owned and operated the last double-circle headrig lumber mill on the coast (not a bandsaw, no, two 60″ circle saws running tooth to tooth, and no debarker either, didn’t need one with a rig like that). It was out on Green Valley Road, west of Graton just below Harrison Grade. A mere timber beast I was tehn and starving. Italians. They told the other side of the story, the tale of grunge effort and catastrophe, and they had the pictures to prove it. Of course family mythology doesn’t change the gross result. Frankly, back in the day, cleared ground was as valuable as the tree standing in the way, maybe more. Selling the tree paid for the road that opened this country up. It gave the land value, provided the means to enterprise and created direct employment in the woods, on the boats, in the mills and pretty much made towns possible. Two sides to everything. At least. Just ask three people. I love the redwoods. I love that they prosper like weeds and that they become, in the fullness of time, the columns of the natural cathedral in which we puny men, knowing that we have the power to strike the giant down, acknowledge our puny-ness and are forced to comtemplate the eternal fact of mortality. Yeah, that happens to everybody, even timber folk. JT: I see what you mean … the guy who donated the land that became Huddart Park was himself a timber baron who made a fortune cutting the redwoods. In his will he left 900-plus acres to be set aside as a park that would never be cut. The Phleger family also wanted their land kept wild, when they could’ve fattened their fortune by developing the land. Europe was emerging from the Dark Ages. It has outlived forty generations of humans. It has survived fire, wind, storm, the axe. Today, it is just middle-aged – will it be alive a thousand years from now, in the year 3006? Will we paltry humans still be around to bear witness? For now, thanks to far-sighted individuals, the redwoods of Muir Woods National Monument and elsewhere stand in defiance of time’s relentless march; they thrive in timeless contrast to humans’ destructive drive to turn a forest into so much “board-feet”; they grow, live and perish – but never really die, for they have ensured a method of perpetually passing along their cloned DNA — at their own pace and rhythm. From our limited human perspective, they seem to have devised a sure-fire formula for eternity, one which renders all in their exalted presence mere insignificant homunculi.